Git is a powerful way to share and control source-code. It can keep track of source-code, its changes and collaborate with other developer's safely. But, unfortunately, most of the client tools that can communicate with Git are all based on command line (aka shell or prompt). Remembering all the Git commands and their parameters are difficult and very hard on your brain. A branch-based approach becomes pretty hard to see and you can miss the whole overview of dependencies and relation between branches. 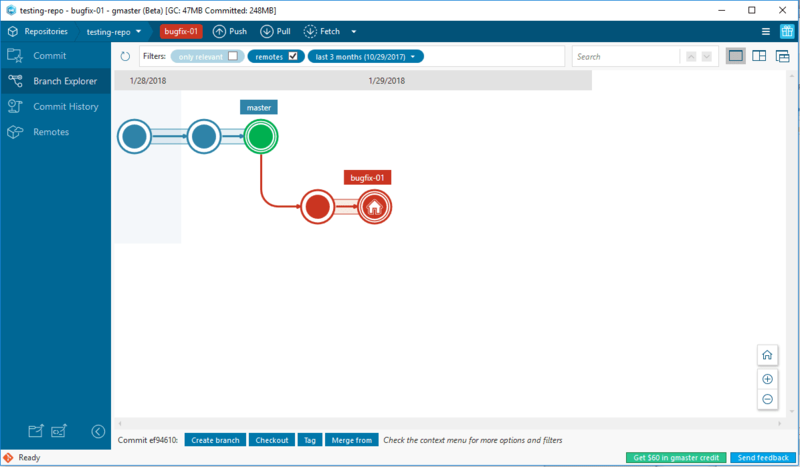 This is why a graphical interface client for Git can transform and improve your development process. And gmaster can take this to the next level. In this post, we are going to cover the first steps with gmaster and you will be able to see how much detail you miss by not using gmaster. First of all, you need to install gmaster. Just click here and you are good to go. Right now, we only support Windows but we are adding new platforms very soon. 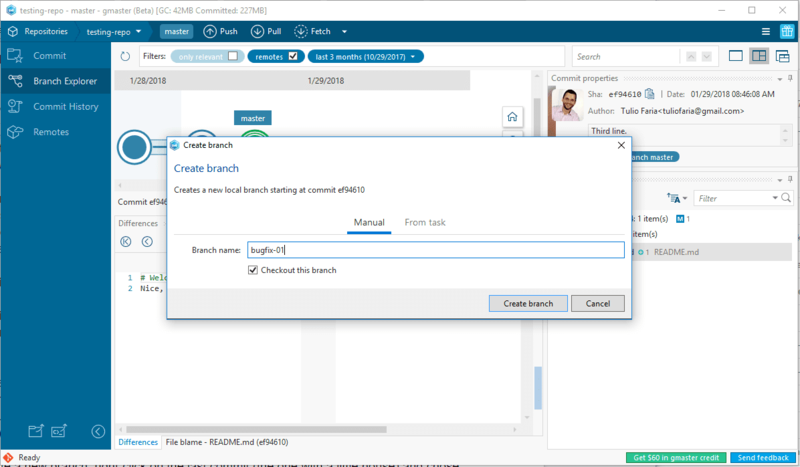 This screen shows clearly a preview of how Branch Explorer looks with a full-branched repository. (There is still an empty repository but it's so nice to see what is coming next). This screen is what every developer should see first when start working with Git. Why? 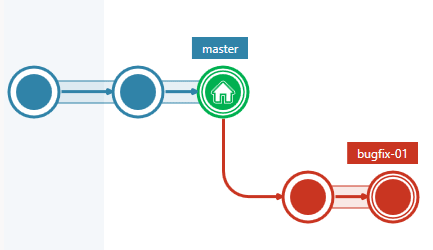 Because it visually summarizes a very powerful feature of Git – branching. (We are going to talk about this soon). Tip: If you don't see any changes, click the reload button and gmaster will look for changes. Enter a new comment for these changes too. It is a good practice to describe in some detail every commit, this way you don't need to check every file change to understand what was changed. After this, click Commit. Now, change the README.md file again. Add a second line with a random sentence. Repeat the steps to commit this change. After that, repeat the same process for a third sentence in the same file. 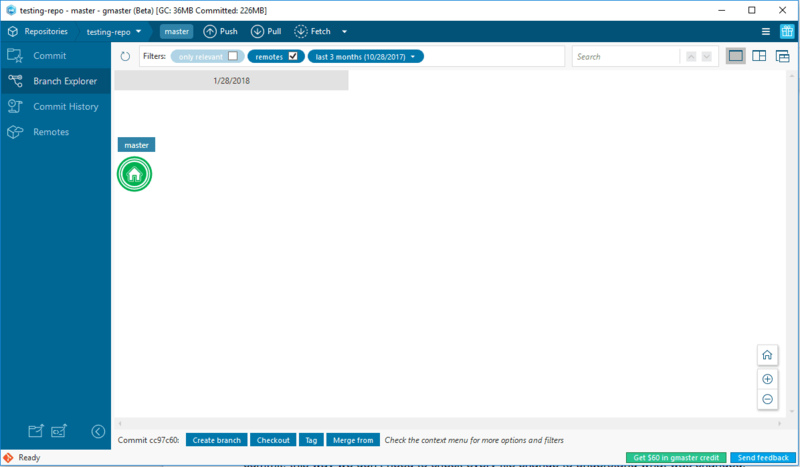 Switch back to Branch Explorer. Branch Explorer is really a nice feature in gmaster that allows you to visually check what your versions history looks like. If you mouse over each commit, you can see a summary of changes. If you double click on it, you can see the details of that commit. Branching is a really nice feature in source-control systems. It allows you to start a new line in the history of your repo. It's like a fresh new beginning but you can choose from where to begin - in this case, you can start this line from any commit. Imagine that you want to bug fix some things in your project. During the fixing process you can have unstable (or untested) code that is not quite nice to have in your main line. (Most teams use the main line or master branch as the most reliable and stable version of the project). So, this is where branching is so powerful. To create a new branch, right-click on the last commit (the one with a little house) and choose Create branch from this commit. Keep the Checkout this branch checked. (This will make your working files appear in this new branch). 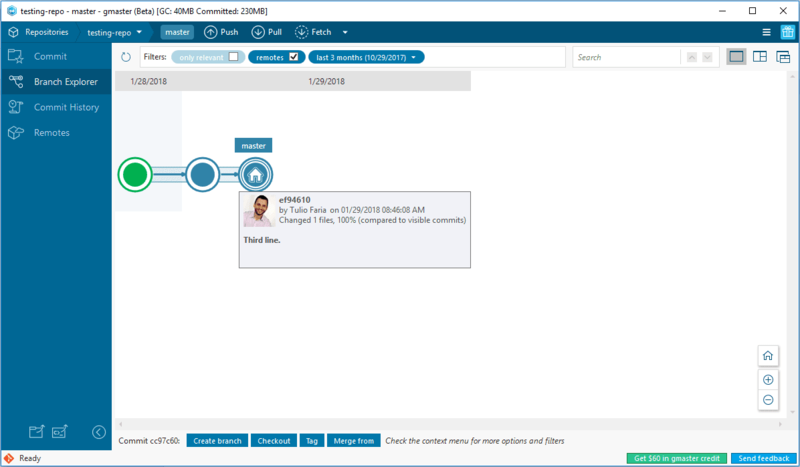 Your Branch Explorer will look like the following image. 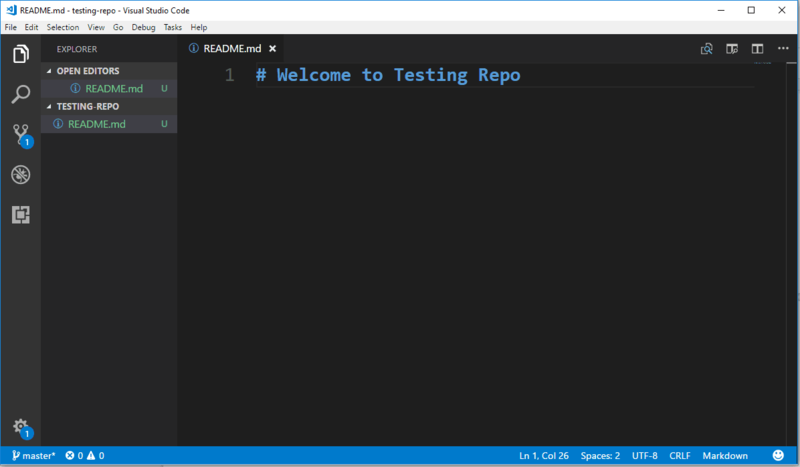 Now you can add some changes to the README.md file and you can commit them. Just add another line, commit, add another line and commit ;). A really nice thing is going to happen ;). 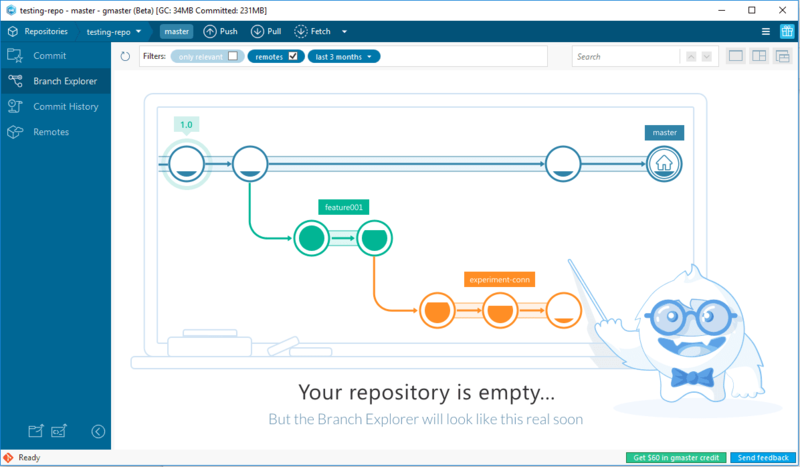 Switch back to Branch Explorer to see how amazing your commit version looks now. You can see that you created a new path in the process - and this is amazing. Usually you need to imagine this. (Remember most Git clients are based on command-line). Anytime during your development process, you may need to revisit the past such as checking how a deleted feature looked in the past and later keep working on the latest version. In the Git world, this is called checkout and it changes which version of your repository that you see in your file system. Let's try this out. 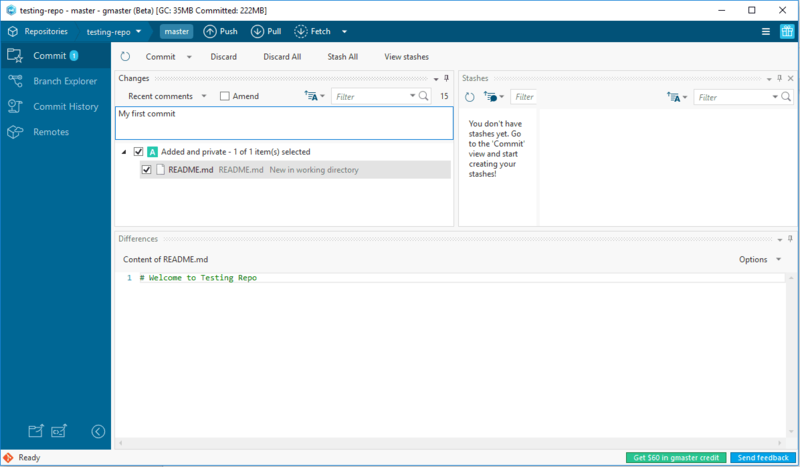 In Branch Explorer, right-click on a green commit. (The one with master over it). Select Checkout this commit. You will note that the "house" icon moved to there and this is how you know which commit is reflecting in the filesystem. (This is also called the working version). Now, if you open the README.md file in your favorite editor, you can see the file before the changes were applied in branch bugfix-01 :). Nice huh? From here, you can even start adding changes again and committing them. For example, let's add a new line at the end of README.md and commit it. Now, you have a very interesting scenario; you moved both history lines in parallel. The master latest version is no longer the same from the moment you branched bugfix-01 from it. Here you may be testing some small changes but in real world you can have a bunch of changes in several different files. You can imagine in this same scenario that there could be several developers branching from master to create new features; there will be a lot parallel working happening. So, you want to apply everything you changed in bugfix-01 over to master. This is the opposite of branching and it's called merging. 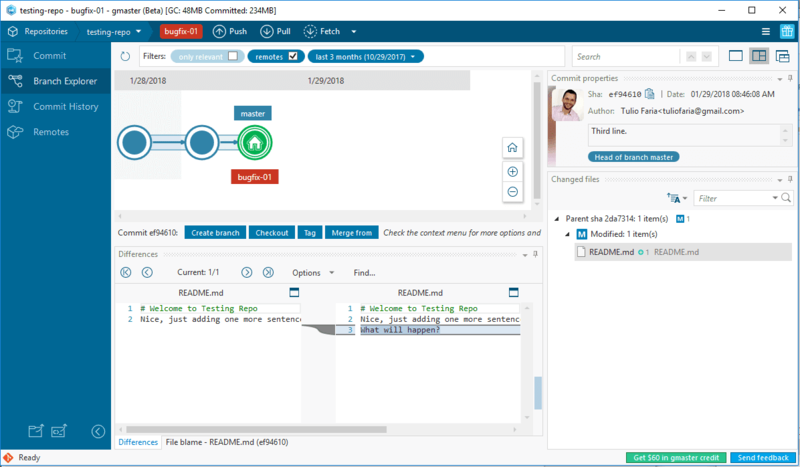 In Branch Explorer, right-click on the latest commit from bugfix-01 and select Merge from this commit. 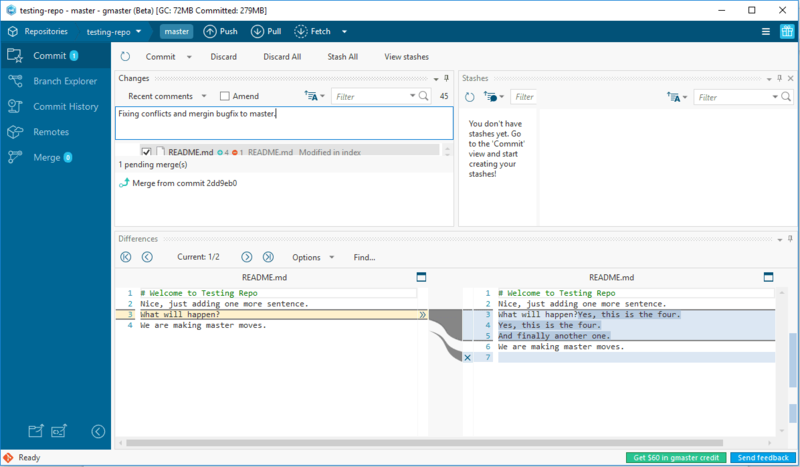 gmaster will open the merge tool where you can review the changes and how you should keep changes from each commit. In some cases, this merge can be done automatically, but in this next example we generated a conflict changing the same line in the same file. We need to fix this. Let's click on Process all merges. This will open the Merge Tool. This tool allows you to see three versions of the conflict; how it looks in the parent version and, in each side, how it looks in each branch/commit. 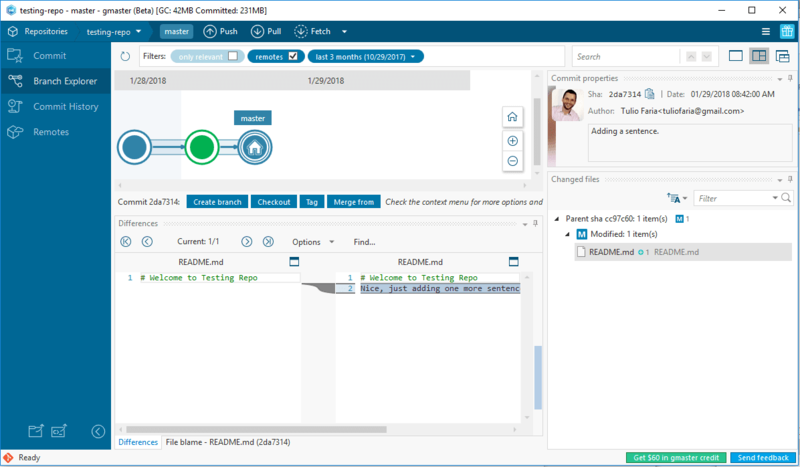 In the bottom half of the screen, you can see and edit the resulting file. Note that Mergetool is trying to merge them automatically (you can check a resulting file with some changes) but we are missing some changes in resulting file. Now, just click Save and exit and the merge screen will tell you that everything is ok to proceed. Switch back to the Commit screen and you can see how you fixed the conflicts (all the changes applied). Let's add a comment saying that you are merging bugfix to master and click Commit. 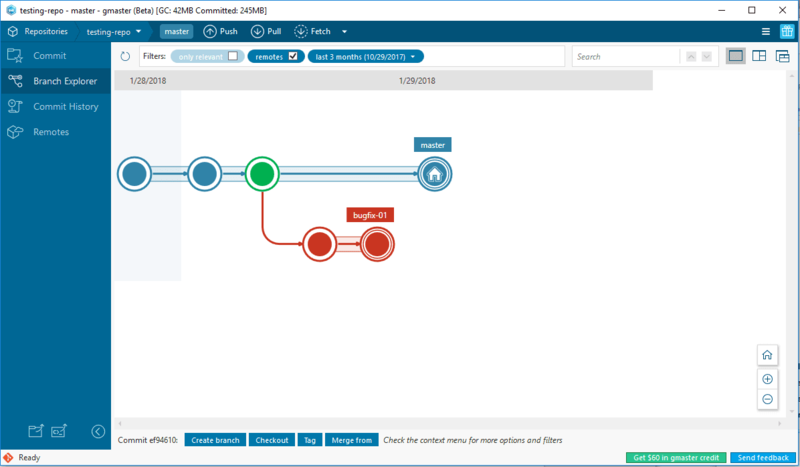 Switch to Branch Explorer and now you can fully understand what happened. It looks amazing, huh? This post showed you the kind of awareness and clarity in a branching process that demands a lot imagination when you only use command-line tools. 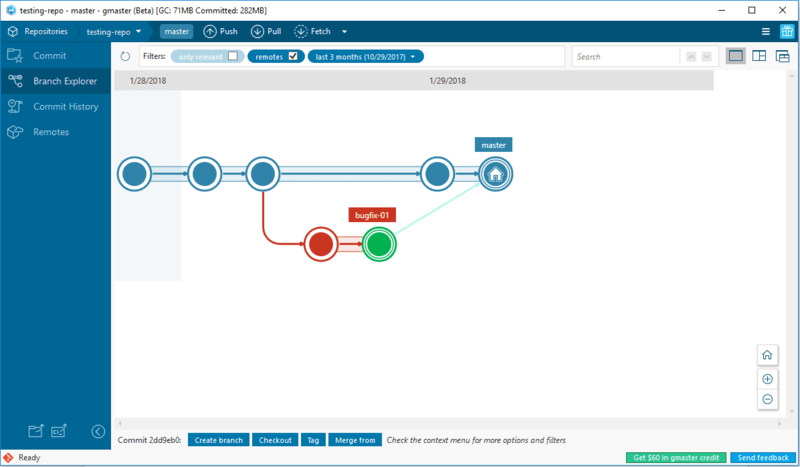 gmaster allows you to really become a master at Git, understanding how each branch/commit relates to each other.